Transactions in foreign currencies are not only supported in sales management, purchase management, receivables, payables, and accounting, but also the forward exchange contract system is provided as one of the ERP modules. You need to appropriately handle various consumption tax transactions such as import tax, tax-exempt export, and taxable domestic transactions. You do not need to create import/export documents, but need a business management system, which handles import/export operations seamlessly, and which is integrated with domestic purchase/sales and domestic inventory management system. Since you often handle transactions denominated in foreign currencies, conversion to Japanese yen is necessary for performance evaluation such as sales performance. What is possible with Plaza-i? 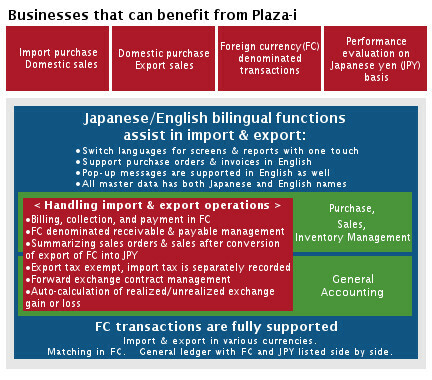 Only large-scale ERP systems handled transactions in foreign currencies; however, Plaza-i processes them concurrently with domestic transactions of billing closing, consumption taxes, and promissory notes, resulting in a high-performance and cost-effective business system. Imports in various currencies, processing export transactions, English purchase order forms and invoices. Flexible change of the tax billing status (Exempted export sales). Allocation of import related charges to purchase costs. It is possible to translate exports denominated in foreign currencies into Japanese yen and to update sales performance on a real time basis. Balance management of receivables and payables denominated in foreign currencies. Automatic calculation of realized or unrealized exchange gain or loss. General ledger output with foreign and Japanese currencies listed side by side.